Isn’t it time that you enjoyed a whiter smile? Whether you’re about to walk down the aisle or you are getting ready to tackle that important job interview, one thing is certain: how you look matters. You want to feel confident in your appearance and one simple way to do this is to turn to teeth whitening to refresh your smile and remove dental stains that affect all of us. Find out how our Barrington, IL, cosmetic dentists Drs. Douglas, Chase and Connor Pennino can get your smile several shades whiter. When you get a whitening product from your local drugstore they are all the exact same strength; however, everyone has different needs and goals when it comes to whitening treatment so not everyone will get the amazing results they were hoping for with at-home whitening. Plus, applying the whitening strips or gels yourself can sometimes lead to uneven results, with some teeth looking brighter than others. Luckily, when you turn to our Barrington, IL, dentists you get beautiful, even results. We also know that you don’t have a lot of free time to waste and that sitting at home with whitening trays or strips for an hour each night just isn’t possible. If you are looking for the quickest and easiest way to a whiter smile then you can’t get faster results than in-office teeth whitening. A standard in-office whitening session only lasts about one hour and often times one session is all that’s needed to get the results you want. There are some patients who are a little hesitant to turn to teeth whitening because they already have some tooth sensitivity and worry that whitening could make it worse. While it’s true that whitening can cause some tooth sensitivity both during and after your treatment, we can also customize your whitening treatment to fit your needs. This means that we will monitor your whitening the entire time to reduce your chances for tooth sensitivity while still helping you achieve the look you want. Nothing can wreck your self-esteem faster than having a stained and yellow smile. As a result, you may find yourself avoiding certain social situations or hiding your smile from those around you. With professional whitening you’ll feel a newfound freedom and confidence in your smile. In fact, those who feel more confident about their appearance also experience more personal and professional success. If you are ready to get a more radiant smile then it’s time to turn to the cosmetic dental team at Pennino Family Dentistry in Barrington, IL. Let’s sit down and find out if teeth whitening is the right way to brighten your smile and boost your appearance. Put away that at-home whitening kit and read this if you want a whiter smile. If you want to get a brighter smile but find that whitening toothpaste and other at-home methods just aren’t doing the trick, then you may be frustrated that you can’t get your smile whiter. This is where our Barrington, IL, family dentists Drs. Douglas, Chase, and Connor Pennino come in. Discover the difference that professional in-office whitening can make for your appearance. Yellow and even light brown stains can certainly make your smile fizzle and affect your self-esteem; fortunately, this simple cosmetic treatment can turn that all around in about one hour. 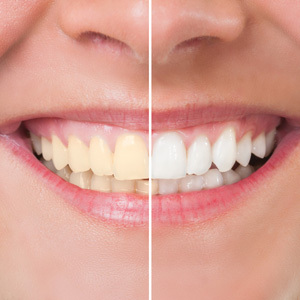 Depending on the severity of your stains, our in-office whitening system could give you a smile that’s several shades whiter in just one quick and easy session. So, what goes into professional teeth whitening? We are so glad you asked. Once our Barrington, IL, dentists have examined your teeth and gums to make sure that teeth whitening is the best approach for whitening your smile, the next step will be to give your smile a thorough clean. Removing plaque and tartar buildup first is to key to more even results. From there, a device is placed into the mouth to keep it open and to provide a barrier for the gums and lips so the bleaching agent doesn’t come in contact with delicate soft tissue. This device also reveals your teeth, making it easy for us to paint the whitening gel evenly over the front surface of your teeth. The whitening gel is left on for up to 15 minutes so that it has time to break down those stubborn stain molecules lying within the enamel and dentin layers. 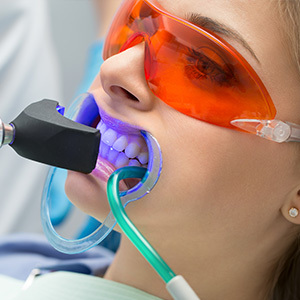 Sometimes a dental laser is directed over the teeth to speed up the effects of the gel. Once the 15 minutes are up, we will remove the gel and apply a fresh new gel layer over your teeth. Most whitening sessions require multiple applications and in about one hour you’ll walk out of our office with the visibly brighter smile you’ve been looking for all along. Are you ready to get whiter results through professional teeth whitening? If you said “yes,” then it’s time to call Pennino Family Dentistry in Barrington, IL, to schedule your free cosmetic consultation with us to find out if teeth whitening is right for you.